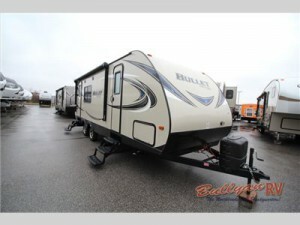 The Keystone Bullet travel trailer is sleek and smooth on the outside and full of amenities on the inside. Easy to pull with fuel efficient crossovers, cars, and trucks the Bullet is an excellent choice for weekend getaways or a cross-country trip. With room to sleep up to 5, you can take your family on a nice, relaxing trip without having to worry about, well, anything! The slick Keystone Bullet travel trailer. 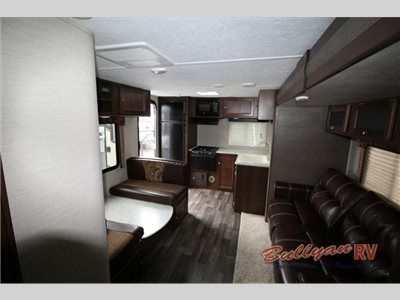 You can see the difference in the Bullet travel trailer before you even go inside. The exterior has an aggressive front profile for Increased towability, aluminum framed front, rear, and side walls dual propane tanks with cover, oversized exterior pass thru storage with lighting and triple entry steps with an oversized grab handle. Comfy and stylish with everything you need! Whether you sleep in the bunk room or the master bedroom you will have plenty of storage space. The bunk room has an oversize wardrobe and the master has it’s own wardrobe and even more storage under the bed. The master even has a laundry chute! Last, but not least, there is a bathroom with a wonderful curved shower, toilet and sink/vanity area. No more sharing public bathrooms at the campground. Having your own means it’s always clean and always close by! For a weekend away or a longer road trip on or off the beaten path, the Keystone Bullet travel trailer has everything you need and nothing that you don’t. If you are ready to camp comfortably, contact us today to get started!